The last several months have been like Christmas day for Helen Kasch and Janice Newlands. Newlands and Kasch were responsible for studying, organizing and cataloging a world-class collection of dolls, amassed by Elaine Annen. “It’s a collector’s dream because of its diversity,” Newlands said, adding half of the dolls were made between 1830-1960, the rest from 1961 to present. 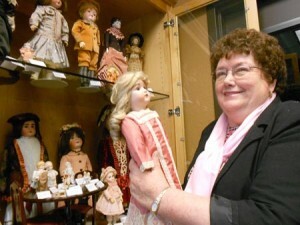 A curator, Newlands said the Elaine Annen Doll Museum opens April 28. 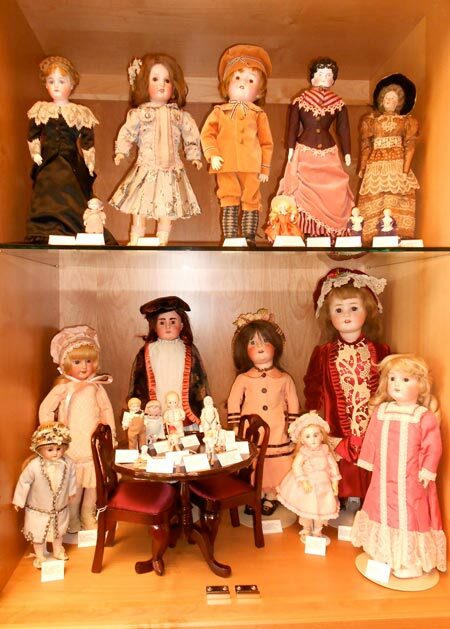 Consisting of more than 300 dolls from various continents and eras, the doll museum is the only one of its kind in Oregon. Housed in a gallery in the Mount Angel Community Festhalle, the museum features the collection of Annen, who was born and raised in Mount Angel. The museum’s collection was selected from 1,000 dolls for their quality, diversity and historical value. Annen had sought the help of fellow doll club members and professional collectors Newlands and Kasch to evaluate the collection and to make the selection for display. It took Newlands and Kasch 10 months to evaluate the collection. They carefully examined each doll for authenticity, pricing, and appropriate clothing with the help of numerous reference books. “Elaine totally trusted us with the dolls. It was like Christmas every day being with her dolls. We wanted two of us because we didn’t want just one person’s opinion,” Newlands said. They paid special attention to the clothing, especially with regards to the dolls that were more than a century old. “When you have a doll that’s 150 years old, the clothing may not have survived,” she added. “A lot of the older dolls were made for affluent people. Some of the French dolls, for instance, sold for the equivalent of about $100 in the 1800s. This was about a year’s wages for some of the poorer people,” Newlands said. Most of these dolls are breakable, explaining why they’re rare. Each of the dolls in the museum is displayed with a card that has the manufacturer’s name, the date and country of origin, the materials used and whether it still wears its original clothes. “We’re hoping that the little cards will help people to more fully appreciate the collection,” Newlands said. Annen began collecting dolls as a hobby in 1968, when an elderly friend bequeathed her doll to her. “She took me to her big, old house. She opened a drawer and in it was an old German doll,” Annen related. she took interest in the beauty, the craftsmanship, and the history embodied in this doll. “This started my interest in dolls,” Annen said. Smitten, Annen began acquiring collectible dolls. After retiring from her job at the Mount Angel US Bank in 1982, Annen found more time to develop her collection. “Wherever I’d go, I’d bring home a little doll. I got intrigued with learning the history about them. Where was it born? How old is it? I’d stay up late at night researching what I really did get,” Annen said. Not particularly fond of modern dolls, Annen prefers dolls from the days when dolls were lovingly handcrafted and represented cultures and values that were quickly being eroded by modernity. “The modern dolls that you see now, like the Barbie dolls. Urgh!” Annen exclaimed. “And yet, about half of her collection in the museum is modern. Not to mention that there’s a Barbie and a GI Joe in the collection,” Newlands said. A doll collector doesn’t acquire a doll simply because she likes it, Newlands explained. Various factors come into play, including diversity and the need to put a collection in context. A doll collector from when she was a young mom, Newlands wouldn’t let her children play with her collection because most older dolls were not made to serve as toys, but as family heirlooms. For one thing, they were not made to pass today’s safety codes. Newlands mentioned that Annen came from a family that valued dolls as a lasting gift to be passed on to future generations. In fact, Elaine’s grandfather, Henry Saalfeld, acquired a large 34-inch doll from Germany in 1904 for his first granddaughter, years before she was born. That granddaughter would be Elaine, the sixth child with five older brothers. After Elaine came two sisters, a brother, and a sister. “This doll, however, is not going to the museum until I’m in heaven!” Annen said. Annen was 12 years old when her mother died, and she had to take on the duty of helping to raise her younger siblings. Years later, Annen, who never married, continued to help with the care of nieces and nephews, who have inherited some of her dolls. “I gave each one of my nieces an antique doll,” she said. Annen is grateful that there’s now a place where her collection can be enjoyed and appreciated by people who visit the Festhalle.